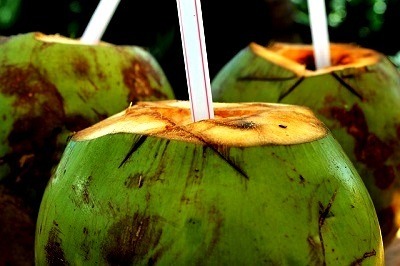 » 11 Amazing Health Benefits of Coconut Water: You Should Start Drinking It Today. 11 Amazing Health Benefits of Coconut Water: You Should Start Drinking It Today. You might have many questions in your mind about the well known and probably easily available to all, the coconut water. Is coconut water good for you? If it is then what is coconut water good for or what are the coconut water health benefits? You would get all your queries resolved regarding this natural drink here. Coconut water is often referred to as nature's sports drink. It is not the same as coconut milk or coconut oil, it is actually a form of vitamin-enriched water, provided by the mother nature. Coconut water is derived from what is known as the endosperm of the coconut plant. Essentially, this is the tissue that provides the nutrition for the seeds in their developing stages. "Coconut water without additives has about 45 calories for 8 ounces or 240 g and that is less than the average commercial sports drink. Along with being low in calories, it is a good source of a variety of body essential minerals and vitamins:​ "
Coconut water is a natural hydrator. Drinking it will keep your body hydrated, which will speed up your metabolism. When your body is not properly hydrated, your metabolism slows down. And if the metabolism is compromised your body has a hard time to burn calori﻿﻿es. Coconut water is a good and natural source of a weight loss aid. Coconut water has been used for good digestive health for many years. It has only recently become popular in western cultures, as people discover the positive benefits of it. It will not cause the digestive tract to be irritated in any way as many other sports and diet drinks can do. Coconut water can help with irritable bowel syndrome, by reducing inflammation, and providing nutrients that are properly absorbed by the body. Coconut water lowers triglycerides, which can significantly lower your chances of having cardiovascular issues. In a study done with rats, those administered coconut water had lower levels of cholesterol and triglycerides. Coconut water is a natural diuretic. It provides a cleaning type effect to the body, helping to flush out excess salts and fat. Keeping your body hydrated is always a positive step in promoting health, and proper hydration will also help keep your blood pressure under control. As already said, maintaining the proper hydration promotes health in general. ​The high content of vitamin B provides energy, which then promotes exercise, a critical step in avoiding strokes and heart attacks. Dehydration is a major contributor to brain malfunction, and can lead to confusion, and causes migraines. We know the importance of calcium for healthy bones, but it's not always easy to get enough calcium in our diet without adding too many extra calories. As we age, it is common to experience bone loss. Coconut water has a pleasant taste, and knowing you are drinking something that is good for you, can promote a healthy feeling and lead to healthier choices, ultimately leading to less stress and anxiety. The natural content of vitamin B in coconut water can help fend off depression and anxiety. We tend to take our vision for granted, however, when something affects our eyes, the importance of our vision becomes all too apparent. ​Your eyes can become dry, which is a painful and a recognized medical condition known as the dry eye syndrome. Proper hydration can help ease the discomfort of dry eyes. You may be familiar with those annoying eye twitches you get from time to time. With a proper immune system, your wounds will heal faster, however, when your immune system is compromised wounds can linger and risk infections. Because the coconut water has natural vitamins and minerals it is easily absorbed by the body, and can provide a solid basis for a healthy immune system. Nature provided compound of vitamins and nutrients in coconut water, reduce inflammation within the skeletal system. It also works to lubricate the joints which in turn can help with inflammation. There are actually a few side effects of coconut water. Obviously, one is that it does contain calories, some carbohydrates and high in sodium. Though it has considerably fewer calories than most sugared drinks, consuming large amounts of coconut water could lead to weight gain. Consume it in moderation, taking the 45 calories for a 1 cup serving in mind. The positive side effects of drinking coconut water are better overall health, lower blood pressure, better cardiovascular health, a better digestive system, and weight loss. Deciding to drink coconut water on a regular basis can be a step in a positive direction for your health. Be sure to purchase actual coconut water, which is different from coconut milk. Also, make sure there are no additives, coconut water has a pleasant taste without added flavors, so there is no reason to add additional flavors or calories. Many athletes have replaced those sugary sports drinks with coconut water, and swear by it. As always, check with your health care provider if you have questions, especially if you are on a restricted diet. Try replacing two sugared drinks a day with coconut water and feel the health benefits as your body is hydrated and nourished.